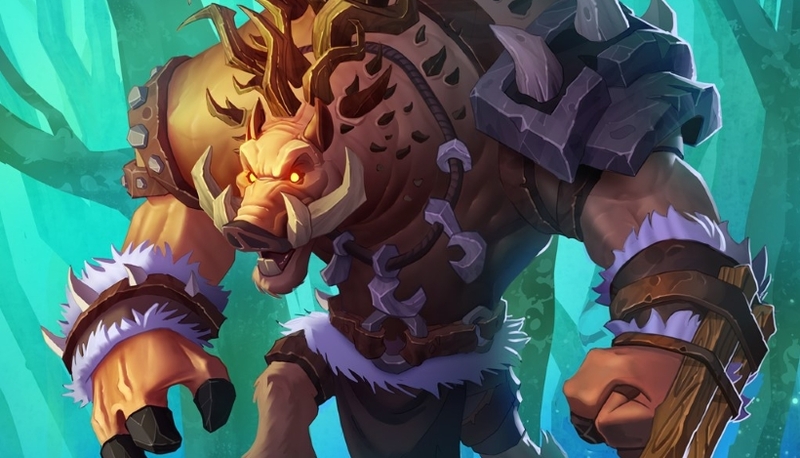 Our Odd Rogue deck list guide features the best Rastakhan deck list for Season 61 of Hearthstone (April 2019). Our Odd Rogue guide also contains Mulligan advice, card combos and strategy tips. One of the new Neutral Legendary cards that was added with the Witchwood expansion goes by the name of Baku the Mooneater. This horrible creature from the forests around Gilneas dramatically improves your Hero Power, but only if you include him in a deck that contains odd - and only odd - cost cards. For the Rogue, that improved Hero Power comes in the form of a stronger 2 / 2 Weapon for 2 Mana (essentially the enhanced version Justicar Trueheart used to provide back in the Grand Tournament eta). It’s proven itself to be such an effective archetype for Rogue that it’s stuck around in an identical form, even after an influx of new cards in Rastakhan’s Rumble! In the eighth edition of our Odd Rogue guide, we're highlighting one of the strongest version of the deck seeing play in the current meta. We've also provided some Mulligan advice, strategy tips and a teardown of the combos contained in this version of the archetype. That should be more than enough to get you started with this old familiar deck. This deck list had slipped off our radar and had been incorrectly updated previously. Apologies for the inconvenience this caused. We now have the latest deck list for you, along with a revised guide to accompany it. Here's the strongest version of Odd Rogue that's being played in the current meta. VIDEO GUIDE - The following video gives a great overview on how to actually play Odd Rogue and we highly recommend watching it. The deck list will be a little different from the latest version, but the broad advice for playing it remains the same. 1. Though Odd Rogue is an aggressive deck, don’t neglect minion trading if you can do so efficiently. 2. Where possible though, try to keep most of their minions in check using your hero power. That extra one damage is surprisingly impactful. 3. Dire Mole is a fantastic early-game minion against fast opponents as you may well be able to mop up a couple of their minions using this creature. 4. Hench-Clan Thug is excellent against aggro decks with few removal options. They may have to waste a handful of resources to stop it growing out of their reach. 1. Use buff cards like Deadly Poison more aggressively – the earlier you can ramp up your damage the less chance they’ll have to stabilise. 2. Board clears are your major weakness, so avoid going too wide if there could be one coming next turn. 3. Unless a minion is very threatening, hold onto your Vinespine Slayer for negating any big taunt minions that are put in your way. 4. Keep your hero power active and don’t be afraid to swing in for two damage each turn or use your health as a resource for killing their minions. 1. Dire Mole: The high health usually means this minion can survive against an opponent’s one drop. 2. Hench-Clan Thug: Can grow out of control fast if you regularly attack using your hero power. 3. Fire Fly: A solid, cheap minion to play at the start of a game. 4. Argent Squire: The Divine Shield can cause problems for opponents and it often trades with two minions. 5. Vicious Fledgling: This beast can very quickly get out of control if your opponent doesn't have an immediate answer for it. Look for Windfury at first so you can get a second shot at a buff on your second attack! To help you get started with this deck right away, here's a look at all of the combos that exist in this exact version of Odd Rogue. - Southsea Deckhand can only attack immediately if you have a weapon in your hand, so think carefully before spending its last point of Durability. - Whenever you hit the enemy player, your active Hench-Clan Thug will gain an extra +1 / +1 of stats. It's very common to dagger up on Turn 2, play the Thug on Turn 3, then hit the opponent with your weapon to trigger a fast upgrade for this minion. - Play another card first on the same turn and you'll be able to direct two points of damage at an enemy target of your choice using SI:7 Agent. -Vilespine Slayer is another card that requires you to play another card first if you want that devastating Battlecry effect to go off. - When Fungalmancer is placed on the board, the minions either side of it will gain +2 / + 2 of stats. - Keep in mind that when you fill your hand - and empty your deck - with Myra's Unstable Element you'll enter the Fatigue system starting with the next turn. These are the most important cards you’ll need for Odd Rogue. Deadly Poison: With the improved hero power this makes your daggers deal four with each hit and can start to rack up some serious damage as a result. Hench-Clan Thug: With all the attacking your hero will be doing through the game this card can spiral out of control quickly and single-handedly win you the game if left unanswered. Leeroy Jenkins: A vital part of your damage to finish off your opponent. If you don’t have Leeroy Jenkins, then consider a Reckless Rocketeer for the burst or an additional Cobalt Scalebane. Vilespine Slayer: Save this to remove any large and annoying taunt minions your opponent plants in your way. You can also run Walk the Plank instead as a slightly less efficient option. Baku the Mooneater: Without this the deck wouldn’t be Odd Rogue at all and you’d lose the improved hero power. At nine Mana you rarely want to play this card, though, let alone find it in your hand. So this is the 2nd month your odd rogue still has cold blood which is an even card anyone going to fix that or recommend a replacement? walk the plank is given as a substitution to a vilespine slayer, but that is a 4 mana card so than baku wouldn't work anymore. I think the only vilespine slayer substitution is that 5 mana basic card, forgot the name. @braindrops Hi! You're absolutely right and I'm sorry this happened. I've fixed it now. For what it's worth, Giggling Inventor has found a spot in this list now, so it worked out as a good opportunity for another update!